The North American electromagnetic NDT Market is expected to grow at a CAGR of 8.84% between 2015 and 2020. The electromagnetic NDT equipment present a huge scope in various industry verticals for increasing their operational efficiency and providing quality products. However, the major factor restraining the growth of the h America Electromagnetic NDT Market is the high cost of equipment. Since the use of NDT inspection is not very frequent in the industries and requires specialized workforce to carry out the inspection, many industry players prefer to rent rather than buy the equipment. The stringent government safety regulations and growing demand from the automotive and aerospace segments are the key factors driving the North American electromagnetic NDT equipment market. The development of infrastructure, increasing industrial development, and the strict regulations of the governments regarding safety and environmental issues are boosting the growth opportunities for the North American electromagnetic NDT market. The key players in the North American electromagnetic NDT equipment market included in the report are GE (U.S.), Olympus Corporation (Japan), Foerster (U.S.), Zetec, Inc. (U.S.), and Magnetic Analysis Corp. (U.S.), and others. There are various types of h America Electromagnetic NDT Market inspection methods such as eddy-current testing (ECT), remote field testing (RFT), and alternating current field measurement (ACFM) testing, which are used by several industry verticals. All these types of electromagnetic NDT equipment possess unique characteristics according to which they are selected to carry out the inspection tasks. Among all electromagnetic NDT testing methods, eddy-current testing is the most commonly used to inspect non-ferromagnetic materials. On the other hand, remote field testing is used for the inspection of carbonsteel and other ferromagnetic materials. The demand for electromagnetic NDT equipment used in inspections and quality has significantly grown, and is expected to grow further during the forecast period due to the increasing emphasis on quality control among industry players across various industry verticals. Government safety regulations, the prominently growing automotive and aerospace sectors, and the new power generation projects in the U.S. are some of the significant drivers for the growth of the North American electromagnetic NDT equipment market. However, the high cost of equipment and the lack of qualified technicians are the key factors that are restraining the growth of the North American electromagnetic NDT equipment market. This report on the North American electromagnetic NDT equipment market covers various types of Non-Destructive Testing (NDT) inspection methods such as eddy-current testing (ECT), remote field testing (RFT), and alternating current field measurement (ACFM) testing, which are used by the industry verticals. 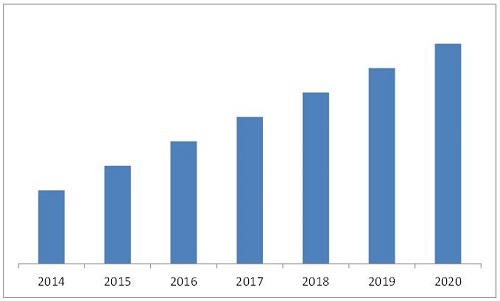 The report also describes the industry trends, drivers, restraints, and opportunities of the magnetic & electromagnetic NDT market and forecasts the market to 2020, segmented on the basis of methods, verticals, and geography. It covers the key verticals of the magnetic and electromagnetic NDT equipment market including the oil & gas, power generation, aerospace, automotive, foundries, process industries, and others (medical and healthcare, infrastructure, and mining). Among all the verticals, power generation is expected to be the largest contributor to the overall magnetic and electromagnetic NDT equipment market in North America. This vertical accounted for 24% of the market share and its market size is expected to reach $48.65 million by 2020, at a CAGR of 7.59% between 2015 and 2020. For this analysis, the Electromagnetic NDT Market has been segmented into countries such as the U.S., Mexico, and Canada.